On July 12, the day before the World Cup final match, the Police of Rio de Janeiro arrested 19 activists, aiming at disintegrating the big protest scheduled for the final’s day, on the grounds that they would have taken part in “violent” acts in riots last year and they would be planning other actions in the final manifestation of the World Cup. In total 23 search warrants and arrest and temporary detention were met against people accused of participating in social movements, the mandates were 5 days of probation, four people managed to escape the police kidnapping. The activists were taken to the City of Police in Rio de Janeiro, a large complex of police departments built to take care of the repression of the people challenging the mega-events and the logic of the market town. In this large complex is the DRCI, Bureau of Suppression of Computer crimes, which currently plays the role of the historic Precinct of Political and Social Order, the infamous DOPS created in 1924 to suppress the anarchists, mainly used during the Vargas era and later Military regime in 1964, in order to control and repress political and social movements opposed to the regime in power. The kidnapped activists were all sent to the prison complex of Bangu. A few days later they were granted a release order that freed 18 activists who were arrestes. Soon after, justice decreed again the arrest of these 18 people, which, however, escaped and remained underground. Camila, Igor Pereira and Elisa (Tinkerbell) continued arrested for around 10 more days, when he was granted bail to all, except for Caio Silva and Fabio Fox, arrested in January this year accused of murder. The activists go through a difficult time of criminalization and persecution, even awaiting trial in freedom, they can not leave the city or participate in demonstrations and public gatherings. This December, Igor Mendes was arrested again and 2 more activists went underground, accused of not complying with the court order and have participated in a peaceful public event last October 15, representing, according to justice, a threat to public order. More arrests may arise at any time and the trials that take place over the next few months can still get them to condemnation. Police said the arrests are based on research that has taken place in camera proceeding since September 2013 against the Popular Independent Front (FIP), black blocs and other activist groups, with conspiracy charges. The police methodology is monitoring, and the breach of confidentiality and privacy of individuals. The 23 militants are indicted by an extensive and absurd list of offenses ranging from armed gang until possesion of explosive, depredation of public and private property, endurance and injury, and corruption of minors. The State that made more prisoners in Rio because of a football match is the same state that closes schools, which kills in the “favelas” and that made the World Cup. With these arrests the Brazilian State wrote another page in its history, it was the day when all masks have fallen, not only the state but also of political parties and groups who want it as it is, that take part in this so called democracy, this so called parliamentary representation. On this day the state said in so many words “WAR AGAINST THE PEOPLE”, not in a subliminal way, but to anyone who would listen. In the slums we already know that long ago, the marches of June / July 2013 also tried to warn, but this time it was in prime time and with all the letters. Where the population saw that the same State that creates the laws, breaks them when it pleases, and always made poor and black population throughout the genocidal history of the Brazilian state. 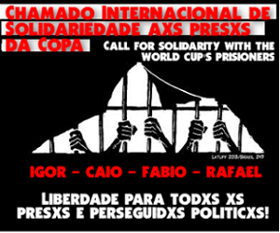 We Invite all to organize actions in solidarity with the World Cup prisoners. We can not remain silent before the state terrorism of the Brazilian government and FIFA dictatorship. Everyone knows the importance of mass riots that occurred in Brazil since June 2013 until now, they have been a milestone in the history of this people, a moment of rupture with the existing structures, a shout against various oppressions and historical violences against the people . Repression forces want at all costs to contain the indignation of the population frightening activists through persecution, want to regain control and conform people to return to the misery of everyday life and they are willing to arrest all of tose who do not retreat in this fight. Our friends need all the support to win this battle and stay in the streets, in the assemblies and popular mobilization. No step back! No one is left behind! For the immediate end to the persecution! A comrade recently received a letter from Abdullah Majid asking for help around his parole board visit in late January, 2015. Please help as you can. Abdullah Majid has been in prison for 33 years for a crime he denies committing. After three (3) trials over four (4) years he and Bashir Hameed (now deceased) were convicted for the murder and attempted murder of two NYPD officers in the county of Queens, New York. 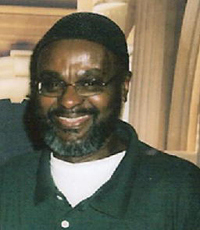 Mr. Majid is finally scheduled to make his first parole appearance January 2015, and he is asking for your support with letters to the parole board for his release. Mr. Majid is aware he will be faced with an uphill fight for his freedom due to the NYPD’s unparalleled influence over the parole board. Nonetheless, he has always been a fighter and is not discouraged in spite of the formidable forces he is up against. Twenty days ago anarchist prisoner Nikos Romanos went on hunger strike to demand his educational furlough. His situation is described as ‘critical’. 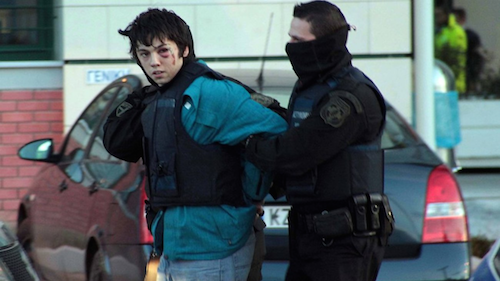 Nikos Romanos’ name is closely tied to the equally well known Alexandros Grigoropoulos, the 15-year-old boy who was shot and killed by police officer Epaminondas Korkoneas in Athens, on December 6, 2008. Only 15 years of age himself, Romanos witnessed his best friend die in front of his eyes. The murder sparked weeks of nationwide rioting. Several years later, Romanos was caught together with four of his comrades while trying to flee from a bank robbery in Velvento. Following their arrest they were beaten up under police custody to such extent that the photographs released by the police had to be overtly photoshopped to hide their injuries. Last spring, while in prison, Nikos Romanos succeeded in passing the Greek entrance exams for university and was admitted to a faculty in Athens. Since September 2014, the beginning of the academic term, he has been eligible for educational furloughs (exit permits) to regularly attend classes. The Ministry of Justice and the President of Greece, Karolos Papoulias, wanted to award Romanos and other inmates for their academic success. However, Romanos, being an anarchist, refused to attend the ceremony as this would go against his principles. The rejection of this invitation from the head of state and the refusal to accept the €500 prize money resulted in a clearly vindictive denial, by the prison council, of Romanos’s application for prison furlough to attend classes. Many believe this is part of a more generalized vengeful tactic of the state to those resisting the new prison system. The type-C prisons in Greece have some similarities with the F-type prisons in Turkey. They are intended for “dangerous criminals” and the “ideological enemies of the state,” which includes revolutionary, political and rebellious prisoners — as well as those who voice their protest against injustices in jail. On Monday, November 10, 2014, with anarchy forever in his heart (as he wrote), Nikos Romanos commenced his hunger strike. He thereby reaffirmed his anarchist principles and explained his motivation in a statement that laid claim to his lawful entitlement to educational leave from prison. In addition to being instruments of control and repression, laws are also used for maintenance of balances or what is otherwise called social contracts; they reflect socio-political correlations and partially form certain positions for the conduct of the social war. This is why I want to make my choice as clear as possible: I am not defending their legitimacy — on the contrary, I use them as political blackmail to gain breaths of freedom from the devastating condition of incarceration. On November 24, Romanos was transferred to the Athens General Hospital Gennimatas, where he remains — under strong police surveillance — to this day. His transfer was accompanied by an official document of the prison prosecutor, who audaciously stated that the hospital doctors bear responsibility for whatever happens to him, thus indirectly urging the hospital staff to enforce force-feeding. During Romanos’ battle, other prisoners joined him as a sign of support and comradery. On November 17, anarchist prisoner Yannis Michailidis went on hunger strike as a sign of solidarity with the struggle of Nikos Romanos and as of November 28 he in turn also needed to be hospitalized in Piraeus general hospital Tzaneio, after he was diagnosed with bradycardia. As a minimum token of solidarity with Nikos, we will also go on a hunger strike as of Monday December 1 — like comrade Yannis Michailidis, who is conducting a hunger strike since the 17th of November — until his claim is met. Together until the end, together until victory. Rather than defend the legitimacy of state laws, Nikos Romanos is using one of the few means of struggle at his disposal in a state of captivity: placing his body as a barricade to get a breath of freedom. All comrades stand firm and continue their hunger strike. The passion for freedom is stronger than all prisons! Danai Limneou is an activist in the anti-authoritarian/anarchist movement in Greece. 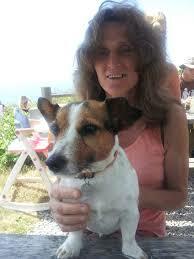 In April 2014, Debbie was sentenced to six years in prison for “conspiracy to blackmail,” in relation to the campaign to close down the notorious animal testing lab Huntingdon Life Sciences. As public consciousness about mass incarceration and police violence grows, the Fraternal Order of Police and the state of Pennsylvania attempt to silence prisoners. Human rights advocates, prisoners, scholars, and journalists have sued the state of Pennsylvania to prevent enforcement of the “Revictimization Relief Act,” which passed the PA House and Senate in October. Notwithstanding, PA Governor Tom Corbett signed SB508 into law on October 21st, and it became effective immediately. The bill allows the State Attorney General or District Attorney to file an injunction on behalf of victims in order to stop prisoners from speaking publicly. The pretense of the law is to prevent “mental anguish” experienced by victims. Abolitionist Law Center and Amistad Law Project on behalf of its plaintiffs released this statement. SB508 was written in response to political prisoner Mumia Abu-Jamal’s commencement address to Goddard College in an attempt to silence Mumia, other prisoners, and formerly incarcerated people. reported Amistad Law Project Legal Director Ashley Henderson. The Abolitionist Law Center, Amistad Law Project, and the Roderick and Solange MacArthur Justice Center are representing Mumia Abu-Jamal, Prison Radio, Educators for Mumia Abu-Jamal, Kerry “Shakaboona” Marshall, Robert L. Holbrook, and Human Rights Coalition in the historic lawsuit against SB508. Abu-Jamal has given three commencement addresses in the past: another for Goddard College in 2008; one for Antioch College in Ohio in 2000; and one for Evergreen College in Washington state in 1999. He has recorded more than 3,000 essays, published seven books in nine languages, with two more books set for publication in 2015, and has been the subject of three major broadcast and theatrical movies. 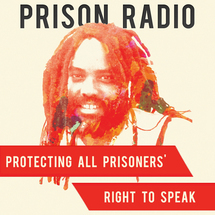 Prison Radio, the non-profit that has been recording Mumia’s commentaries for over 20 years, has launched a campaign to protect prisoners’ right to speak. In response to the coordinated right-wing effort to strip prisoners of their First Amendment, Prison Radio is calling on all supporters of Mumia and prisoners’ rights to join them: http://bit.ly/defendfreespeech. I have forwarded about 5000 letters to detainees held on Nauru and Manus Island. Many people have not received a reply (see below). But the letters are getting through. Keep writing. Letters are getting in. A few are getting out. ” I have just attended at Bravo Camp in RPC2, where I spoke to a number of people. Of the dozen or so I spoke to, 6 said they had received your letters. One wrote back, and purchased a stamped envelope here for one dollar, sent his reply (in English) and received a second reply. That letter enclosed soap, shampoo, canned fruit and chocolates. He was permitted to keep the soap and shampoo, but the food was confiscated. Not permitted to receive food. Another person received 2 letters but didn’t write back, as he can’t write in English. Apparently there is a mailbox at the library (i’ve not seen it) where they can send letters, and purchase the envelopes and stamps as well. One person wrote back twice, and received 2 letters of reply, so there is at least one person that has received a reply. Apparently, it is generally known that many letters have been received by others. Stamps in Nauru: Nauru does recognise Australian stamps, but after lengthy correspondence with the Immigration Department, they tell me that Australian stamps are recognised only if they are bought on Nauru. I have no idea how they can tell where a stamp was bought. · brought to Australia and posted here (this seems simpler and more sensible). I noted that to do anything else (eg, throwing them away) would amount to a serious criminal offence. They have stopped responding to my emails. You may draw your own inferences from their sudden reluctance to say what was done with the letters bearing Australian stamps. Advice: Keep writing. Include your email address: it is easier for detainees to reply by email. Don’t put a stamp on the self-addressed reply envelope: stamps are available in the Nauru camp now. Very strange indeed. Convicted prisoners are allowed to write to people outside but apparently asylum seekers, who have committed no offence, are not. Advice: Keep writing. Include your email address: it is easier for detainees to reply by email. Don’t put a stamp on the self-addressed reply envelope: I understand that stamps are available in Manus now.